meghan’s twirly girl bonnet is the first i’ve seen on a head – made of handspun and recycled sweater yarn. go meghan! i think she might be addicted to sweater recycling ;) i tell you i’m like a disease. and here’s a sea colored root vegetable and stripey one. mmmm. and the first yellow bells jester i’ve seen. i’ve been digging blue and green together lately. there’s a list in the knit one, embellish too ravelry forums with links to interesting embellishments we’ve spotted if you’re interested. p.s. if you’re in my area and want a spinning wheel, i found this on craigslist this morning. p.p.s. i’m so FREAKING slow at updating the shops. but today i listed the first of the book knits!! more hats and more yarns. sorry i’m so slow. 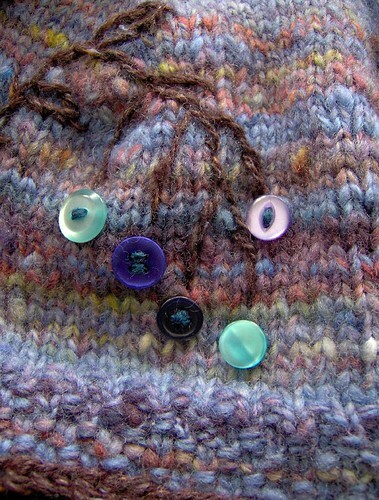 This entry was posted in cosyknitsliterally, knitting by cosymakes. Bookmark the permalink.